In earlier times Sandridge Parish was bigger than it is now. 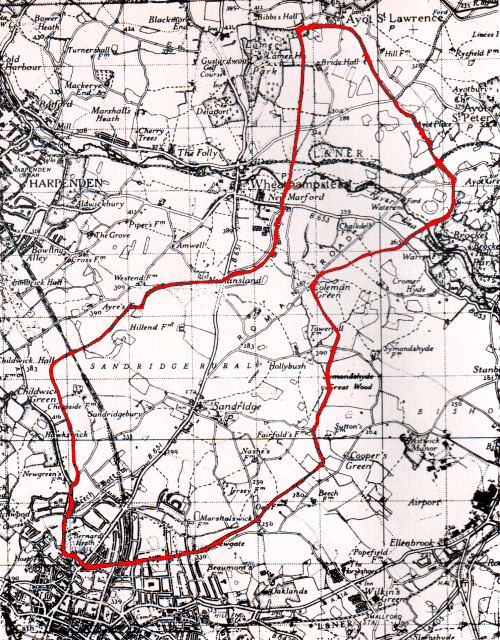 The extent of the parish as shown on the tithe map  of 1842; the St Albans cathedral  records of the fifteenth century confirm these boundaries. The parish stretched from the corner of Sandpit Lane and Sandridge Road, over Bernards Heath, down the hill, through the village and out in a north-easterly direction to Coleman Green, then continuing north over the Lea and over the road from Wheathampstead  to Codicote  and on past Bridehall to within half a mile of the church of Ayot St Lawrence . The length of the parish was nearly six miles in a direct line; the narrowest part was and is by Coleman Green, where the sides come close together to form a neck just half a mile across. The total area was 5,708 acres. 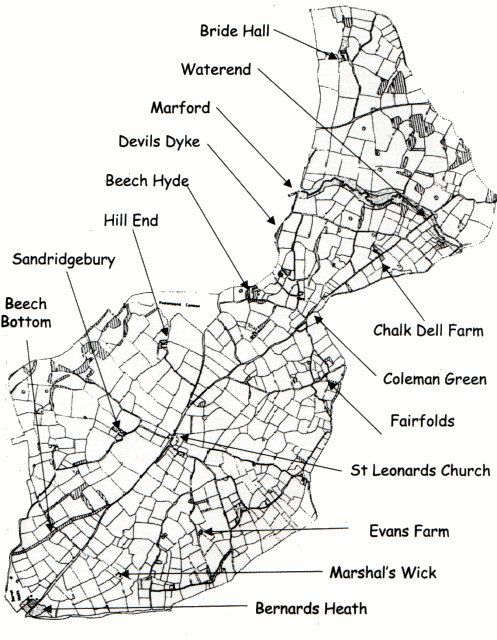 The parish remained unchanged until 1905, when St. Saviour's parish **was formed out of the southern end of Sandridge. In 1923 part of the northern end was transferred to **Ayot St. Lawrence. With the formation of the Parish Council in 1895, it took over the civil administration of the parish; in 19351 a section of the northern part of the parish was from thereon administered by the Wheathampstead Parish Council, and as the city of St Albans  expanded, so did the civil parish of Sandridge lessen. 1. Corrected from 1931 by an erratum on page 47.